This chalice would have been used to serve the consecrated wine that forms part of the Christian Eucharist service. It is one of the many inlaid bass wares made in Egypt and Syria during the first cenury of Mamluk rule (1250-1350) for Christian patrons. The decoration, with its band of silver inlay containing an Arabic inscription, is typically Islamic. The wording, however, states that it was made for 'the reverend father at the monastery of Dayr al-Madfan'. 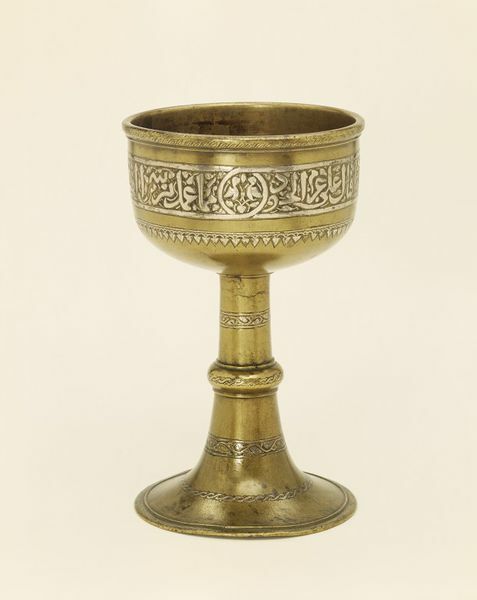 Chalice of cast brass, damascened in silver, with a wide inscription band around the outside of the bowl. The bowl sits on top of a stemmed foot which flares out at the bottom. Below the main inscription band on the bowl, is a single line of leafs in inlaid silver. The stem also features bands of inlaid decoration. 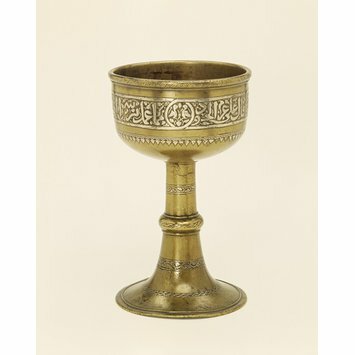 Brass chalice inlaid with silver, Egypt or Syria, Mamluk period, 1250-1350. Apparently made for Christian use by Muslim craftsmen. The decoration on this chalice is typically Islamic, with its band of silver inlay containing an Arabic inscription. The wording, however, states that it was made for 'the reverend father at the monastery of Dayr al-Madfan'. This is one of many inlaid brass wares made for Christian patrons. One of many inlaid brass wares made for Christian patrons.